In five years of running, The Whitest Kids U Know's namesake sketch show has yet to do anything comedically I'd identify as "signature Whitest Kids." The group (one of the first to get recognition for working exclusively online) doesn't seem to have a handle on what it does better—hell, differently—than everyone else. And even if I did get the sense, through the sketches, that the group did know, I wonder if the guys would be adept enough to play up their strengths. The Whitest Kids U Know is, quite simply, generic. Tonight's fifth season premiere is an average sketch show in every respect; not terrible (mostly), but certainly lacking in savvy. The road to mediocrity is a two-pronged affair, the first and most obvious being the beginning and end of all sketch comedy: writing. Or, in the case of Whitest Kids, I should say: editing. The sketches in the premiere have multiple premises, each distracting from the other. In one, a wounded soldier writes a letter home to his wife, whom he expects to never see again. At first he tries to play up how he died a noble death as a super secret important government official, at which point the transcribing soldier interrupts him and says "she'd never buy that." So the wounded soldier starts over, and composes a sweet note that turns out to be fake; all the talk of gruesome, painful details was just to throw the wife off his scent, so he can go off to Monaco and "whore it up for, oh I dunno, 25 years." We see the wife sad, then the soldier skipping away satisfied—suddenly he's shot, and the cut back to the wife shows that the transcribing soldier was, in fact, taking it all down, even the Monaco part. So what's the joke here? Is it that the soldier wants to seem cooler to his wife than he was in real life? That he's faking his wife out? That the other soldier is an over-transcriber? The Whitest Kids don't pick one; rather than having three escalating jokes along one premise, we instead get one joke from three premises, and the sketch is bereft of momentum. Many others fall into this trap. One of the sketches is an ad for one of those compilation CDs, Songs Of Olden Times, and the joke is split between the outrageousness of the archaic song lyrics (mostly about child brides) and the overproduction of the performances themselves, with back-up dancers and the like. Is the joke in "Baked Beans" that the girl is pouring baked beans all over herself, or that the announcer is saying things like "catchphrase" instead of an actual catchphrase? It'd be easier to overlook the writing faults if the other prong (to go back to the forked-road analogy) were in place, and it's something often forgotten about when analyzing sketch comedy: acting. Sketch starts with good writing and can scoot by with merely decent acting, but really bringing a sketch home requires a strong, committed performance or two. It can really make a difference—it's part of the reason why the New York-based BriTANick is so excellent (along with simple, playful writing). 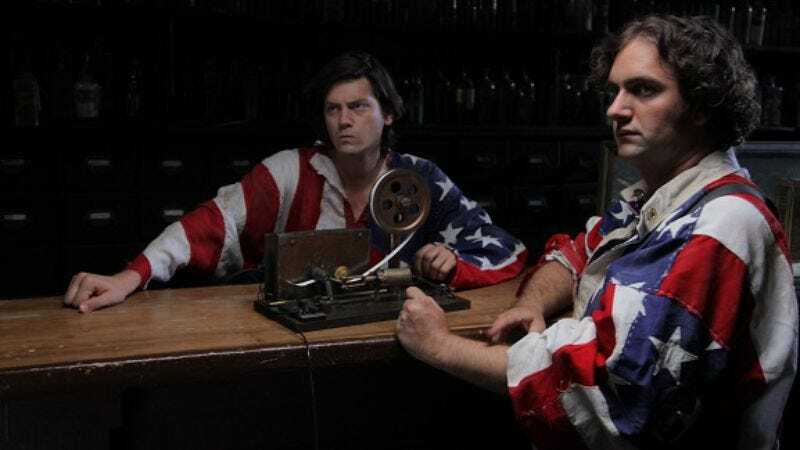 Trevor Moore, the head writer of the show, is by far the best comedic actor though he spends most of the episode playing a stoner in "The Civil War On Drugs." Really, none of the sketches are anchored by a strong lead performance, and the only times I laughed were at offhanded quips like "I can't tell if I hate this class…or I love it," due to surprise. Really there isn't much in The Whitest Kids U Know that surprises its audience. The show establishes a vibe—"Here's a bunch of directions we can take this sketch, and let's do them all"—and only deviates in tiny doses. My favorite sketch comedy defines conventions, then breaks them with abandon. There's no gleeful recklessness to a Whitest Kids sketch, only a heavily controlled environment where things that seem funny on paper are never made any funnier on screen. The show still looks pretty good; IFC wisely knows to give its comics a modest budget. The aesthetics keep Whitest Kids from being downright terrible. Was that kid in the Hitler sketch made to say "kitizens" instead of "citizens" to be cutesy, or do you think it was an accident?